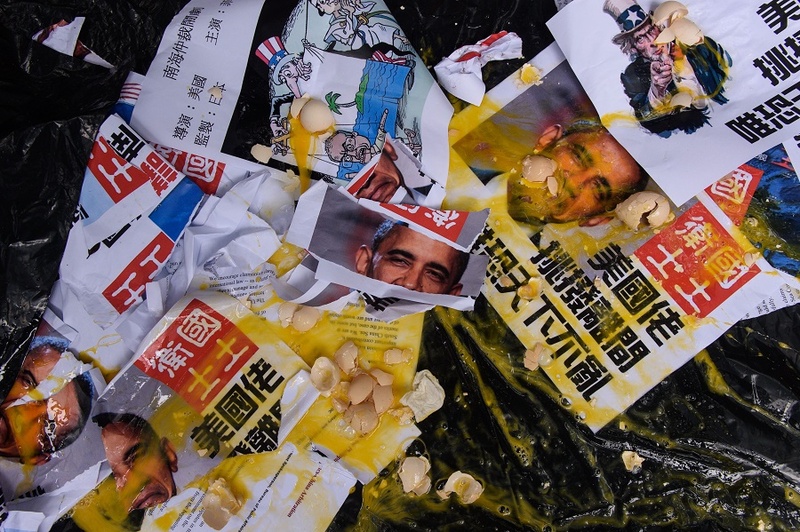 Pro-China protesters throw eggs at photos of U.S. President Barack Obama and torn copies of the ruling by the Permanent Court of Arbitration in The Hague against Beijing’s extensive claims in the South China Sea, outside Hong Kong’s United States Consulate, July 14, 2016. About 50 protesters marched to the Consulate. This article was first published on NYR Daily on July 28, 2016. It has long been routine to find in both China’s official news organizations and its social media a barrage of anti-American comment, but rarely has it reached quite the intensity and fury of the last few days. There have been calls from citizens on the country’s social media platforms to boycott KFC, Starbucks, and the iPhone 7, accusations against the U.S. of waging a new “war” against China, and threats that the Philippines, a close U.S. ally, will be turned into a Chinese province. All of this is in response to the July 12 ruling against China by the Law of the Sea Tribunal in the Hague, which found Beijing to be engaging in a host of illegal actions and violations of international law as it has pressed its territorial claims in the South China Sea. The five-member panel, set up as part of the United Nations Convention on the Law of the Sea, or UNCLOS, had been asked by the Philippines to arbitrate its dispute with China. The tribunal declared that China’s exclusion of Filipino fisherman from the area, its building of half a dozen artificial islands, and the damage it has done to coral reefs and endangered species are violations of the law. In view of China’s one-party state, top-down control, and pervasive efforts to control the Internet, it is tempting to regard the popular response as a nationalist storm stirred up by the government. But do the country’s leaders control the intense nationalist feeling of ordinary Chinese, or are they controlled by it? The South China Sea case suggests the answer may a little bit of both. Of course the Chinese government has had a prominent part in the reaction. Hours after the tribunal issued its decision, the headline on the official Communist Party newspaper, People’s Daily, was: “U.S.-led conspiracy behind the farce.” Last week, China’s ambassador in London, Liu Xiaoming, accused Washington of trying to “humiliate China diplomatically, to damage China’s image, and also to give [the U.S.] a legal basis with which to challenge China.” More generally, the Chinese reaction has been to deny the tribunal’s jurisdiction, to dismiss its ruling as not just incorrect but, as the nationalist paper Global Times put it, “radical and shameful.” The tribunal’s ruling is “nothing but a scrap of paper,” Vice Foreign Minister Liu Zhenmin said, and therefore China is justified in ignoring it. Heavy-handed, intensely aggrieved responses to perceived Western slights have a long tradition in Communist China, where recent history is presented largely as a chronicle of the depredations of foreign powers in the late imperial era—known as the “century of humiliation”—followed by the heroic achievement of the Chinese Communist Party of breaking free from such meddling. To many Chinese, to be patriotic is to support the Party, which has been extremely successful in portraying itself as the force ensuring that China will never be humiliated again. A couple of days ago, the nightly television news reported that the American navy was making aggressive moves in the South China Sea, part of a longer range strategy to “encircle” China. The broadcast showed stock footage of American ships presumably cruising in the disputed area, while again resolutely declaring China’s readiness to defend every inch of its territory. A group of Chinese with whom I watched the broadcast were emphatic in their anger at the United States and support of their government. Among the arguments I heard: The United States has no business maintaining large-scale naval forces in waters so close to China. By goading the Philippines into bringing its case, the United States has worsened bilateral relations and made the Chinese people angry. And in any case, the tribunal—which consisted of judges from Ghana, France, the Netherlands, Germany, and Sri Lanka—was clearly bought off by the United States and decided the case on political rather than legal grounds. For many Chinese, this last assumption is less surprising than it may seem, in view of the absence in China of an independent judiciary. It is simply hard for people here to imagine that any judges anywhere can act free of political control. In fact, the government has felt it necessary to keep some of the populist anger from getting out of hand. China’s Internet censors, as Foreign Policy magazine’s Tea Leaf Nation website has reported, have removed some of the most extreme social media posts, those calling for outright war against the United States or the Philippines. China and the United States late last year carried out joint military exercises in the western Pacific, aimed at preventing an accidental confrontation at sea. China does not want war. This week, Chinese Central TV has been broadcasting a prime-time dramatic series on the late Premier Zhou Enlai, showing him, old and sick, using his every last ounce of strength to bring about the diplomatic breakthrough of 1972 that led to reestablished relations between his country and the United States—the message of this perhaps that, as Chinese commentators have said in the past, the two countries can resolve their differences, if only each recognizes the other’s “core interests”—and China several years ago gave that status to almost the entire South China Sea. Still, it is clear that neither China’s leadership nor the censorship apparatus have shown much interest in allowing an honest accounting of the South China Sea case. There hasn’t been and very likely won’t be any public argument being made here that, like it or not, the UNCLOS tribunal’s decision is legally binding on China. No one will make the case that the five tribunal judges are internationally recognized and respected experts on the Law of the Sea with nothing to indicate that they have ever been subject to political pressure or bribes. It is highly unlikely that Chinese journalists will publish reports detailing the tribunal’s finding that China caused irreparable environmental damage in the disputed areas. It’s hard, of course, to measure the entirety of public opinion on this or any other sensitive matter in China. Perhaps there are substantial numbers of people who believe China’s claims on the South China Sea are spurious, or at least doubtful, and that the country has gotten what it deserved from the international tribunal. If such sentiments are held—beyond a few isolated dissidents—I can find no indication of them. There simply doesn’t appear to be much appetite in China for that kind of discourse. But having opened the gates for a wave of popular chauvinism in response to the tribunal’s decision, the government may have left itself little room for maneuver on the ongoing disputes. “The Chinese government can’t give Scarborough Shoal to the Philippines even if it wanted to because of the laobaixing,” one person here told me—laobaixing being the term for the common people. The same can surely be said about China’s dispute with Japan over the Senkaku chain (Diaoyutai in Chinese). One option open to China, as some experts have been saying, would be to quietly observe the tribunal’s decision, refraining from building any more artificial islands, for example, and ceasing to block Filipino fishermen from their fishing areas. But the intensity of feeling on the South China Sea—as on other matters like Taiwan, Tibet, and criticism of China on human rights grounds—China may be too locked into a nationalism of grievance and its cult of national humiliation to allow for any public compromise, and this would make any settlement of the disputes that bedevil the country’s relations with its neighbors and with the United States all the more difficult.